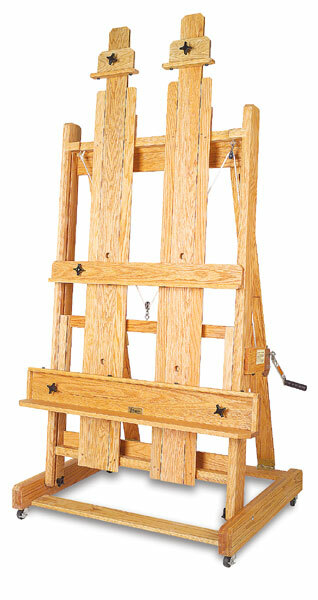 Abiquiu is a heavy-duty easel for professionals who paint large canvases. 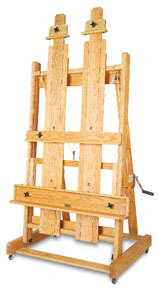 Fully assembled, this easel stands 88" (224 cm) high. It can be extended to support canvases measuring up to 120" (305 cm) high, and virtually any width. Made of solid red oak. A magnificent double-mast version of the Abiquiu Easel, designed to accommodate large canvases with even greater stability. Its wide stance and broad foundation make it the easel of choice for the serious artist who works on a giant scale. Go Deluxe if your canvases are wide as well as tall! ™ Best is a trademark. Abiquiu is a trademark.